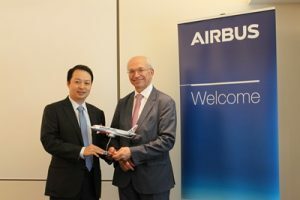 Vietnam’s low fare airlines, Jetstar Pacific, has officially received its first brand new Airbus A320ceo aircraft at Airbus’ factory in Toulouse, France, as part of the airline’s long-term goal to further expand its domestic and international footprint. 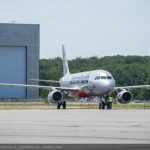 This is the first of 10 Airbus A320ceo aircraft for Jetstar Pacific, following an MOU that was announced last July at the Farnborough International Air Show 2016, in the United Kingdom. After the delivery ceremony on Tuesday, 27 June 2017, the new aircraft will take off from Toulouse for its maiden voyage to Tan Son Nhat Airport at Ho Chi Minh City, before making its first commercial flight in Vietnam. Mr Nguyen Quoc Phuong, CEO of Jetstar Pacific, said: “We are delighted to welcome 10 new Airbus A320ceo aircraft to Jetstar Pacific as we continue to develop and update our modern fleet. “This continues to affirm our long-term commitment of providing low fares every day, in making travel even more affordable and at the same time, exceeding customer satisfaction on our flights,” Mr Phuong added. The Vietnam-registered aircraft with the license number VN-A568 will boast 186 seats in its Economy Class cabin. It is one of the 10 A320ceo aircraft that will be added to Jetstar Pacific’s fleet by the end of 2017. In conjunction with this occasion, Jetstar Pacific had also signed a purchase agreement with IAE International Aero Engines for 24 V2500 engines that includes installation into all 10 new A320ceo aircraft, with four backup engines available. This is a part of the on-going investments made for the growth of Jetstar Pacific from 2016 to 2020, by the airline’s two shareholders – Vietnam Airlines and Qantas Group. Jetstar Pacific is Vietnam’s first low fares airline, operating a total of 36 domestic and international routes. It is part of the Jetstar Group network that flies to more than 80 destinations in 18 countries with 5,000 weekly flights across Jetstar Airways (Australia and New Zealand), Jetstar Japan (Japan), Jetstar Asia (Singapore) and Jetstar Pacific.